Davis, S. D., V. H. Heywood, and A. C. Hamilton (eds.). 1995. Centres of Plant Diversity: A Guide and Strategy for their Conservation. Vol.2. Asia, Australia and the Pacific. WWF and IUCN Informations, Oxford. 578 pp. Rosenzweig, M. L. 1995. Species Diversity in Space and Time. Cambridge University Press, UK. 436 pp. Su, H. J. 1984a. 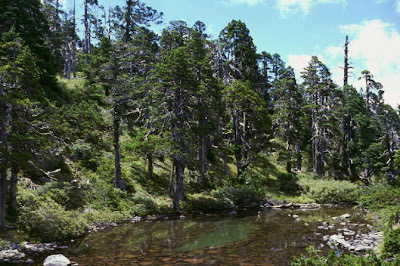 Studies on the climate and vegetation types of the natural forests in Taiwan. (I). Analysis of the variation in climatic factors. Quart. J. Chin. For. 17(3): 1-14. Su, H. J. 1984b. 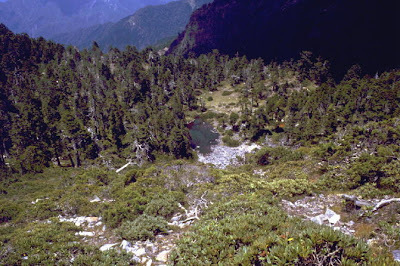 Studies on the climate and vegetation types of the natural forests in Taiwan. (II). 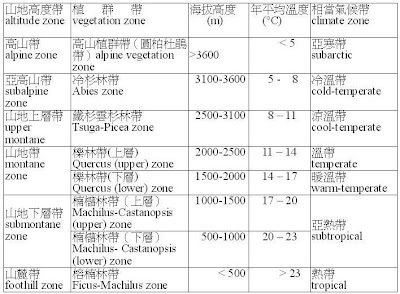 Altitudinal vegetation zones in relation to temperature gradient. Quart. J. Chin. For. 17(4): 57-73. Su. H. J. 1985. 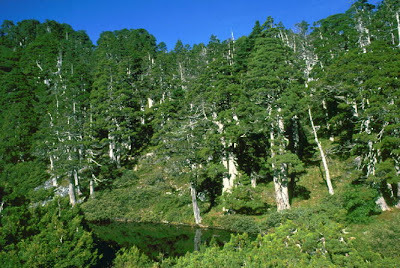 Studies on the climate and vegetation types of the natural forests in Taiwan. (III). 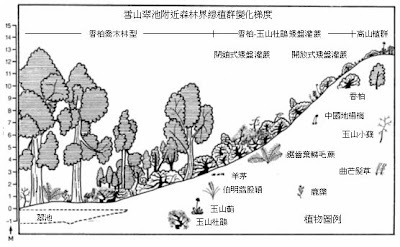 A scheme of geographical climatic regions. Quart. J. Chin. For. 18(3): 33-44. Su, H. J. 1992. 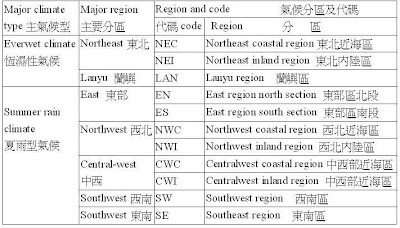 A geographical data organization system for the botanical inventory of Taiwan. Institute of Botany, Academia Sinica. Monograph Series 12: 23-36. Su, H. J. 1993. 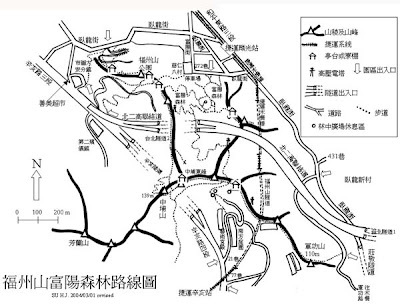 Conservation evaluation on the native species of Calanthe and Phaius (Orchidaceae) in Taiwan. Quart. Journ. Exp. For. Nat. Taiwan Univ. 7(3):1-14. Su, H. J. 1994. 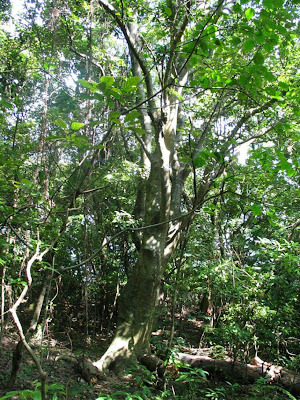 Species diversity of forest plants in Taiwan. Institute of Botany, Academia Sinica Monograph Series 14: 87-98. Su, H. J. 1998. 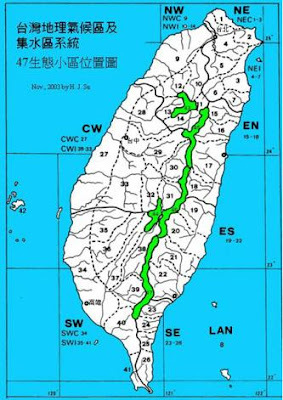 An ecological evaluation of the threatened seed plants of Taiwan. Institute of Botany, Academia Sinica Monograph series 16: 47-64. 龍柏 Juniperus chinensis L. var. kaizuka Hort. ex Endl. 水冬瓜 Saurauia tristyla DC. var. oldhamii (Hemsl.) Finet & Gagnep. 羅氏鹽膚木 Rhus javanica L. var. roxburghiana (DC.) Rehder & E. H. Wils. 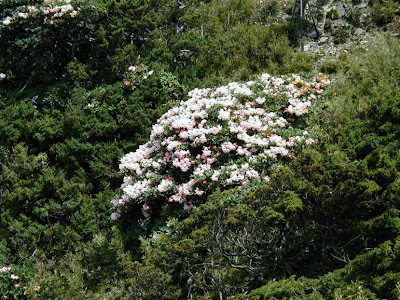 酸藤 Ecdysanthera rosea Hook. & Arn. 燈稱花 Ilex asprella (Hook. & Arn.) Champ. 金平氏冬青 倒卵葉冬青 Ilex maximowicziana Loes. 毬蘭 Hoya carnosa (L. f.) R. Br. 非洲鳳仙花 Impatiens walleriana Hook. F.
山菜豆 Radermachia sinica (Hance) Hemsl. 黃鐘花 Tecoma stans (L.) Juss. 南美蟛蜞菊 Wedelia trilobata (L.) Hitchc. 軟毛柿 Diospyros eriantha Champ. ex Benth. 杜英 Elaeocarpus sylvestris (Lour.) Poir. 廣東油桐 Aleurites Montana (Lour.) Wils. 聖誕紅 Euphorbia pulcherrima Willd. & Klotz. 裏白饅頭果 Glochidion acuminatum Mull. Arg. 錫蘭饅頭果 Glochidion zeylanicum (Gaertn.) A. Juss. 血桐 Macaranga tanarius (L.) Mull. Arg. 野桐 Mallotus japonicus (Thunb.) Mull. Arg. 白匏子 Mallotus paniculatus (Lam.) Mull. Arg. 粗糠柴 Mallotus philippensis (Lam.) Mull. Arg. 烏桕 Sapium sebiferum (L.) Roxb. 青剛櫟 Cyclobalanopsis glauca (Thunb.) Oerst. 子彈石櫟 Pasania glabra (Thunb.) Oerst. 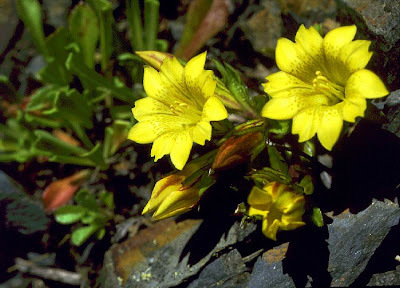 紅楠 Machilus thunbergii Sieb. & Zucc. 鳳凰木 Delonix regia (Boj.) Raf. 葛藤 Pueraria Montana (Lour.) Merr. 駁骨丹 楊波 Buddleia asiatica Lour. 含笑花 Michelia figo (Lour.) Spreng. 蘭嶼烏心石 Michelia compressa (Maxim.) Sargent var. lanyuensis S. Y. Lu et al. 構樹 Broussonetia papyrifera (L.) L’Hér. ex Vent. 大葉雀榕 Ficus caulocarpa (Miq.) Miq. 榕樹 Ficus microcarpa L. f.
雀榕 Ficus superba (Miq.) Miq.var. japonica Miq. 稜果榕 Ficus septica Burm. f.
楊梅 Myrica rubra (Lour.) Sieb. & Zucc. 山桂花 Maesa japonica (Thunb.) Moritzi ex Zoll. 大明橘 Myrsine sequinii H. Lev. 小葉赤楠 Syzygium buxifolium Hook. & Arn. 流蘇 Chionanthus retusus Lindl. & Paxt. 銀樺 Grevillea robusta A. Cunn. 冬青葉桃仁 Prunus phaeosticta (Hance) Maxim. var. ilicifolia Yamam. 羊角藤 傘花樹 Morinda umbellata L.
九節木 Psychotria rubra (Lour.) Poir. 柃壁龍　風不動藤　Psychotria serpens L.
對面花 Randia spinosa (Thunb.) Poir. 食茱萸 Zanthoxylum ailanthoides Sieb. & Zucc. 雙面刺 Zanthoxylum nitidum (Roxb.) DC. 紅皮 Styrax suberifolia Hook. & Arn. 山豬肝 Symplocos theophrastaefolia Sieb. & Zucc. 大頭茶 Gordonia axillaris (Roxb.) Dietr. 三葉崖爬藤 Tetrastigma formosanum (Hemsl.) Gagnep. 拎樹藤 Epipremnum pinnatum (L.) Engl. ex Engl. & Kraus. 柚葉藤 Pothos chinensis (Raf.) Merr. 華南薯蕷 Dioscorea collettii Hook. F.
五節芒 Miscanthus floridulus (Labill.) Warb. Ex Schum. & Laut. 竹葉草 Oplismenus compositus (L.) P. Beauv. 求米草 Oplismenus hirtellus (L.) P. Beauv. 桔梗蘭 Dianella ensifolia (L.) DC. 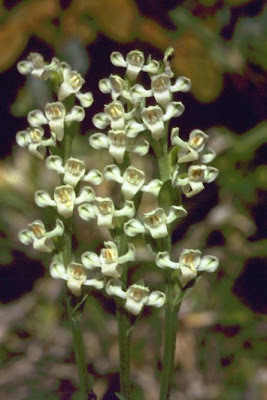 山棕 Arenga tremula (Blanco) Becc. 月桃 Alpinia zerumbet (Pers.) B. L. Burtt & R. M. Sm. 筆筒樹 Cyathea lepifera (J.Sm. ex Hook.)Copel. 崖薑蕨 Aglaomorpha coronans (Wall.ex Hook)Copel.